Turbo Pet Kit is an all-vacuum-cleaner pet cleaning kit. 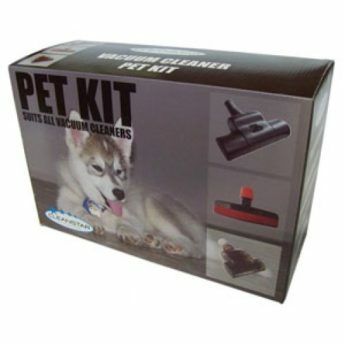 This kit is a great addition to your ducted or portable vacuum cleaners to help you remove pet hair from floor, carpet, rug or furniture with ease. Large Turbo Brush is ideal for picking up hair from floors, rugs and carpets. This is a great package and will make cleaning up after your pet a lot easier and will help your vacuuming more efficient. Suits all vacuum cleaners (ducted and portables).